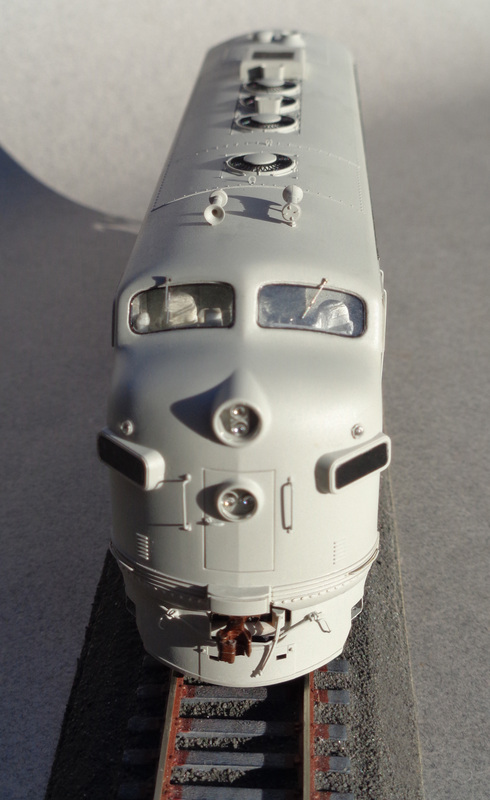 This is a standard EMD F7 A Unit, essentially the same prototype as the old Globe/Athearn "Blue Box" F7, but this was built from the Highliners F Series A Unit kit and then airbrushed light grey. Too often the original and wonderful 1930's Leyland Atwood and the later EMD Art Department's paint schemes obscure the model itself when seen in true and exact HO Scale. We believe this image and many others on this site demonstrate the level of authenticity we have applied to the design and construction of the tooling for the production of these models. Models of what is becoming self evident as the most popular series of prototype diesel locomotives of them all: The Classic EMD F Unit Series of diesels. We know there are many competeing F Units in the HO market, but none approach the authenticity of Highliners. This model was built without any modifications and aside from the bulbs, Sergent Engineering coupler, grab irons (coming soon!) and a full cab interior, no additional parts were applied. At Highliners we have taken the time (a lot) and put in the effort (even more still) so that anyone who chooses to recapture those feelings experienced in an earlier time, those from decades ago, these feelings may be perfectly replicated, literally at will. YOU are in complete control! Although the Athearn Genesis F Series are fine products, as a result of mass production, the attention to finish and detail cannot be to the same level as if you were to take some very enjoyable time and put in the personal effort and build a model or two for yourself, to your own and exact configurations and specifications. This experience is not to be rushed, but instead to be savored as with a fine wine. We have taken all of the difficulty out a doing a conversion from "something else" into your ultimate desire and we've eliminated the extreme effort of scratch building so as to easily achieve true contest winning standards.